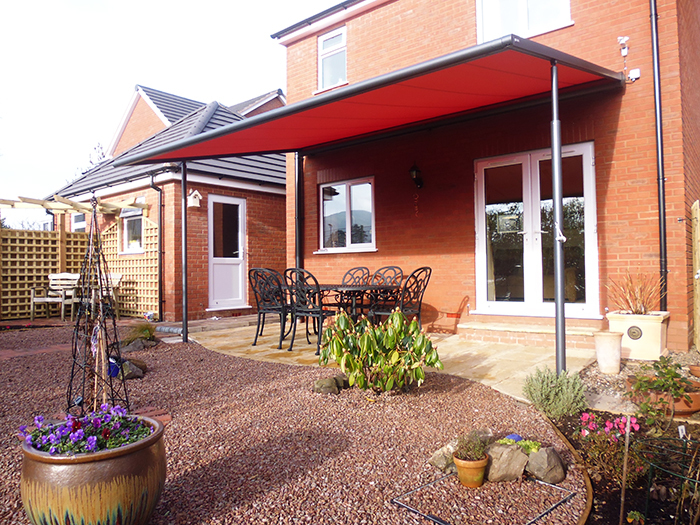 Samson provide a vast range of domestic retractable roof systems offering the ability to cover large areas of patio or terrace areas but with the advantage of being able to retract the roof in finer weather. 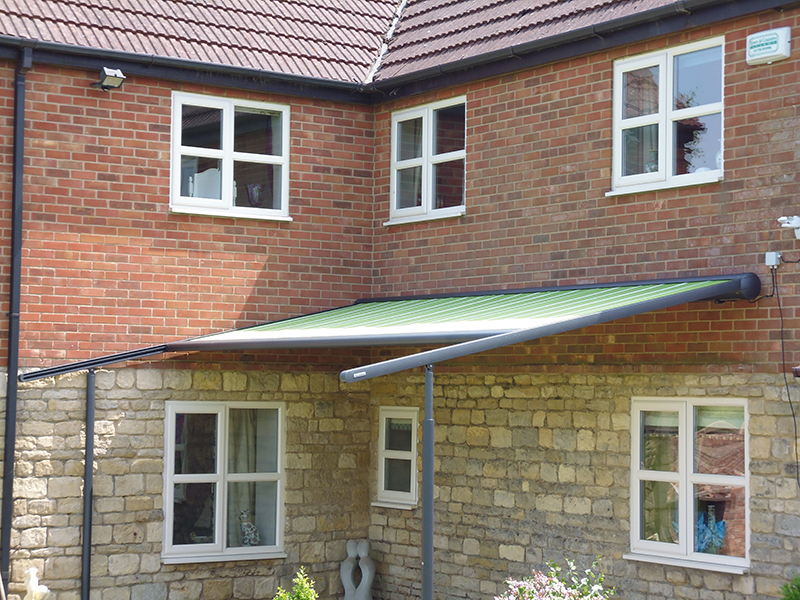 The roof systems we offer are designed to deal with the very diverse UK weather and the various options either guide the rainwater off the sides or into concealed guttering channels built into the framework of the structures. 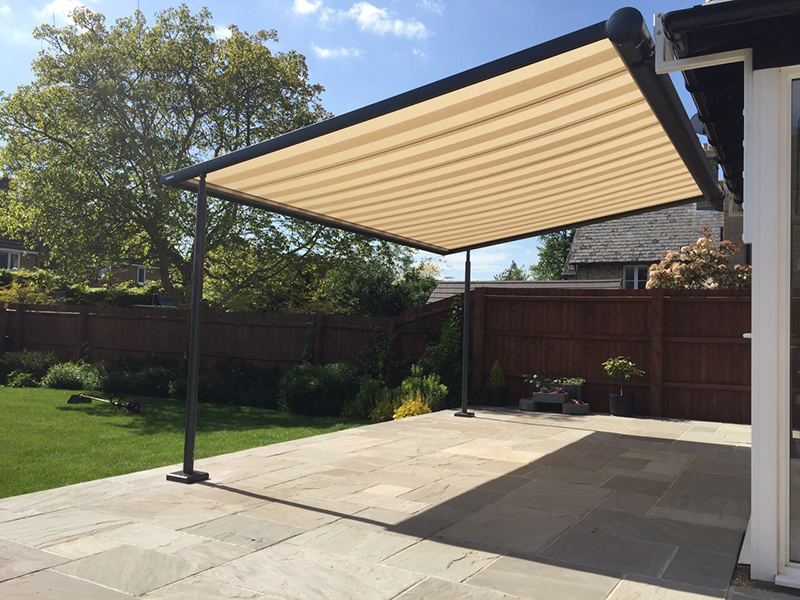 The complete flexibility a retractable roof structure provides can truly be recognised when you specify a system with all the open sides also fitted with products to control the wind and rain ingress as and when required. Our systems are not meant just for use in a single season, but all year round, in most weathers. 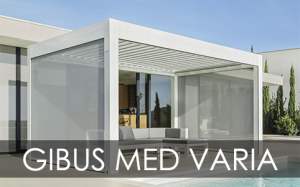 We offer basic systems such as the Markilux Pergola, the Weinor Plaza Viva, or the Gibus Isola Fly, these systems being a retractable fabric roof with rainwater directed to the front or sides only. 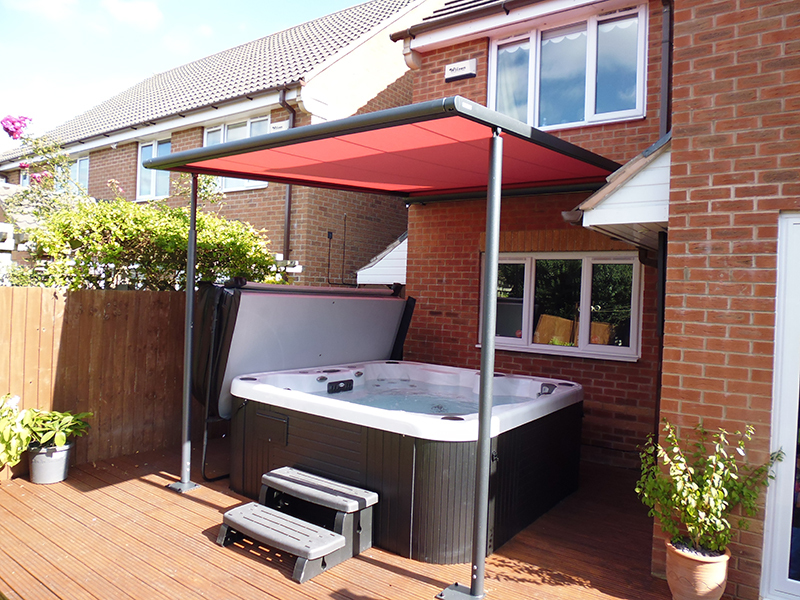 The framework structure is high quality aluminium with powder coated finishing on both systems and also always made to measure. Both systems can either be installed directly onto an existing structural wall or steelwork or be a stand-alone structure, with 4 or more support posts providing the structure base. Either system directs the rainwater away from the wall, providing protection for areas adjacent to the building, or provides a specific covered area away from the building with rainwater directed to the sides of the Isola or the front, lower edge of the Pergola system. 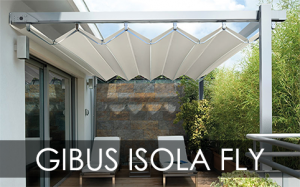 All our retractable roof systems are electrically operated mainly due to their size and also for sheer convenience. Some of the more sophisticated fabric roof systems have such high tension applied on the fabric that manual operation would be far too difficult. Having the roof electrically operated also means there are many ways it can be controlled either directly to using various remote control wireless systems, including of course integration into home automation systems if required. The more enhanced systems we offer include products such as the Weinor Pergotex or the Gibus Med Room system. 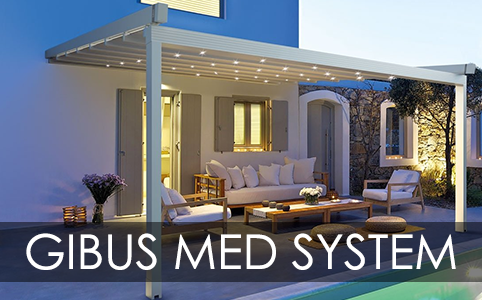 These retractable roof systems have higher specification framework systems allowing the use of additional products to the sides and front such as vertical outdoor blinds or sliding/folding glass doors creating an ‘outdoor room’ where you are protected from the worst weather with no rain ingress from the sides possible. Another benefit of this type of system is the ability to open the roof only and keep the sides closed when the weather is fine but it may be windy. 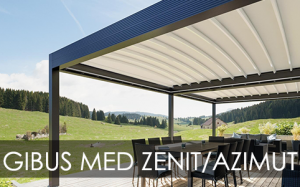 The Pergotex retractable roof is a system requiring a structural rear support such as a house wall and is used more for creating an area directly leading from an existing room to extend the use of the room to the outdoors. 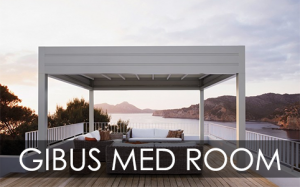 The Med Room is more versatile in that it can be free standing if required and the retractable roof options are more diverse. From the outside a Med room will look like a completely level and flat roof but the roof is actually slanted within the aluminium structure and rainwater collected in channels to be directed down the support posts as required. 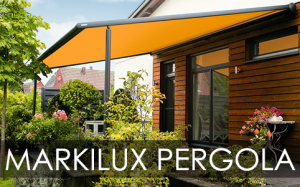 The retractable Pergotex system also adopts this rainwater channel at the front to collect and direct water away. 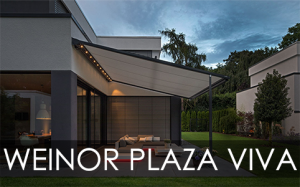 These outdoor rooms or retractable roof systems allow for far more engaging interiors with the options of LED lighting in various places, heating using various systems and the ability to also incorporate entertainment systems. A great many people use these outdoor rooms for entertaining with cooking facilities and dining tables and chairs incorporated, for many it is simply a great relaxing area for reading, listening to music and so on. 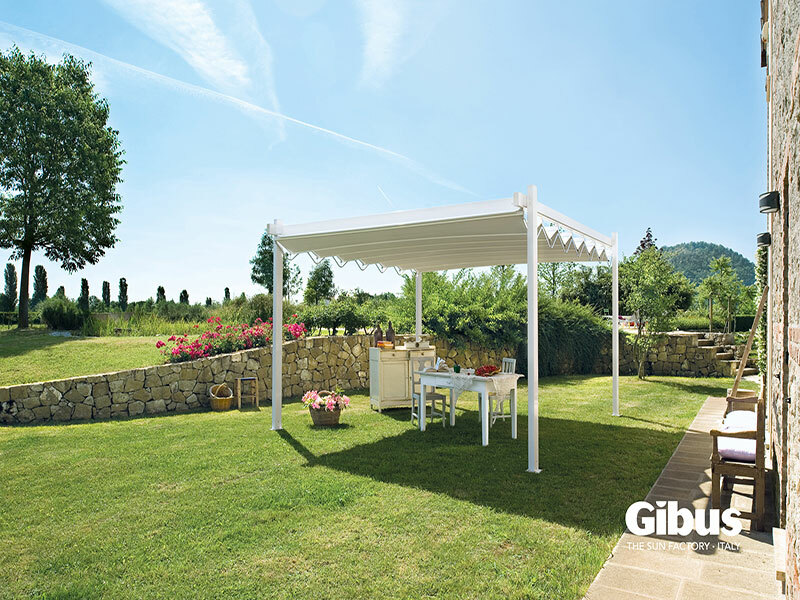 For commercial use the benefits are obvious, extra space for extra customers, who will stay far longer because the weather does not affect their experience. In fact the whole experience may be enhanced, if your pub, cafe or restaurant happens to have fantastic gardens or views then sitting outside and enjoying these facilities whatever the weather can be an attractive proposition. 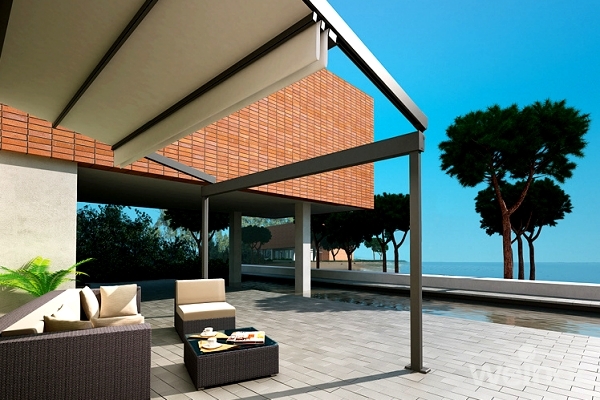 Why Buy A Retractable Roof System? 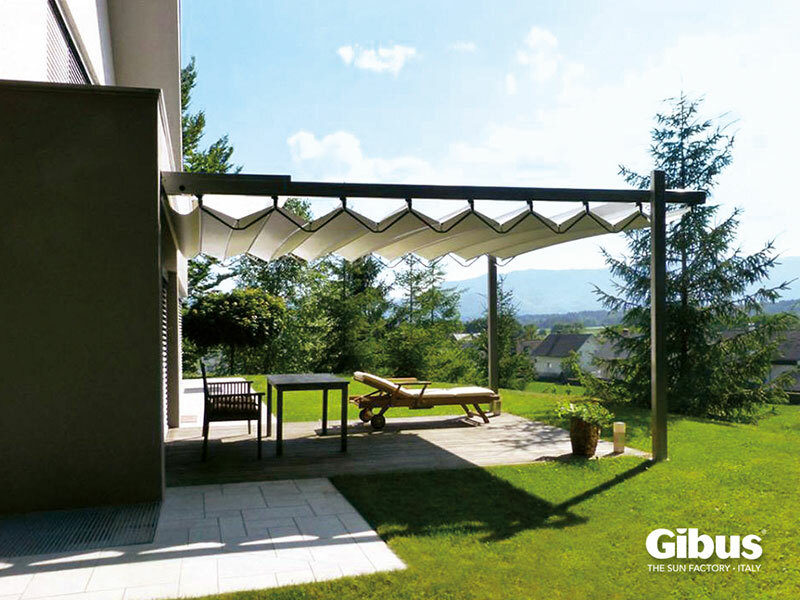 Another great system for creating all year round covered space is called a louvred roof system, or sometimes referred to as a bioclimatic pergola. These are systems using rotating aluminium blades fixed across an aluminium structure. This system has many various brand names in the UK and at Samson we provide the Med ‘Twist’ and the Med ‘Varia’ systems. 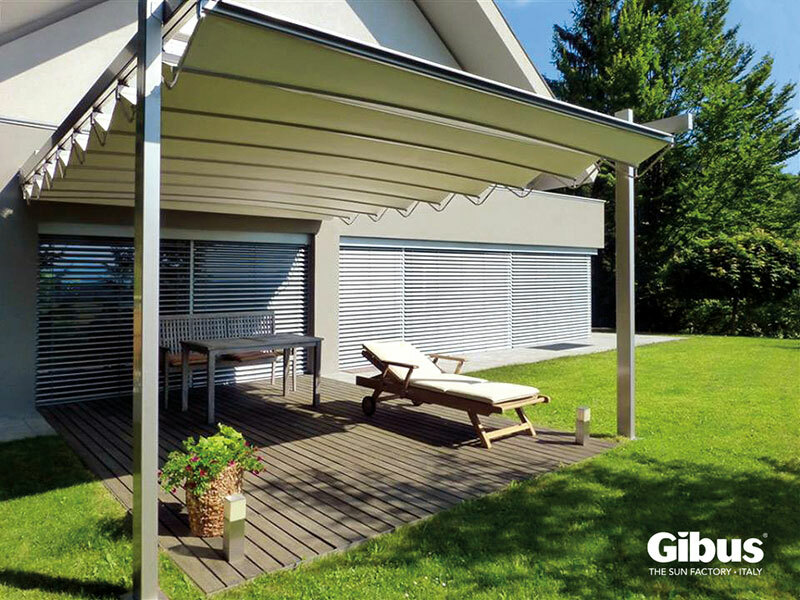 The principal is simple with overlapping aluminium flat, or slightly curved sections rotating next to each other to provide either a solid roof when closed or varying degrees of sun and open weather when the blades are tilted at any angle through to 130 degrees. Rainwater, like in other Med room systems is captured in channels running around the roof structure and directed down the support legs and again, these systems are self-supporting or able to be fixed directly to a building wall to act as an extension of a room. The roof system can have different LED lights integrated in various places and the frame support structure also takes all the various options of side infills to create the outdoor room again. All the rotating roof sections, and any options (integrated blinds, led lighting, infra-red heating, etc.) 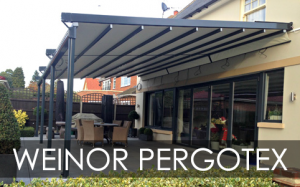 are easily operated from a choice of radio controlled wireless handsets with an informative LCD screen so you can easily select which part of the pergola canopy system you wish to control at any time. Powerful and yet almost silent, integrated electric motors adjust the roof sections and optional integrated blinds whilst built in radio control receivers allow you to turn the LED lighting and optional infra-red heating on and off and also dim if required. 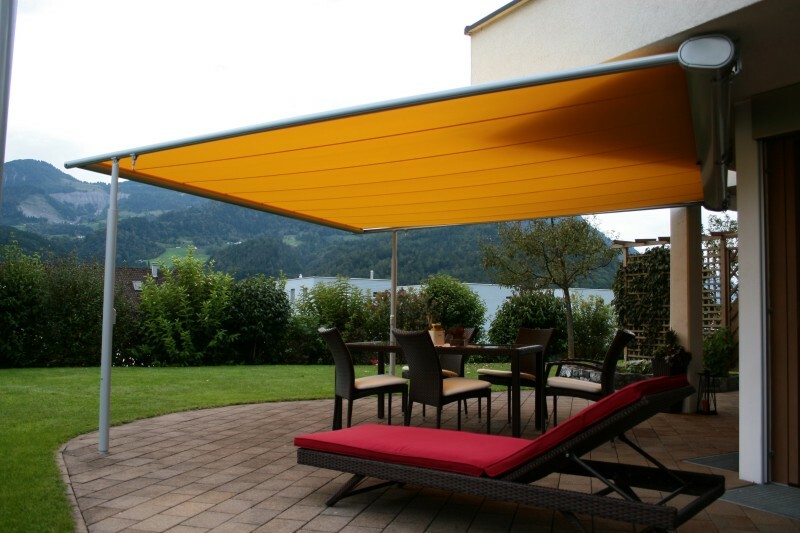 A louvred rood system will enhance any premises with any of the choice of factory finishes available and its tough aluminium and stainless steel construction ensures it will withstand the diverse British weather. 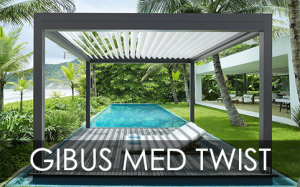 Tested to the severest of quality standards, the louvered roofs can withstand wind speeds up to Beaufort 10.